Fully articulated action figures based on the popular TV series. Exclusive Cyberleader and The Master Action Figures! Each figure is limited to 3,000 individually numbered pieces. Entertainment Earth Comic-Con Exclusive! Travel through time and space with Doctor Who! Reminiscent of the best-selling action figures of the 1970s and 1980s, Bif Bang Pow! 's amazing Doctor Who figures stand 8-inches tall and feature episode-specific fabric clothing, in addition to multiple points of articulation. Based on the incredibly popular television series, they embody that distinctive look and feel of the longest-running sci-fi TV series in the world. 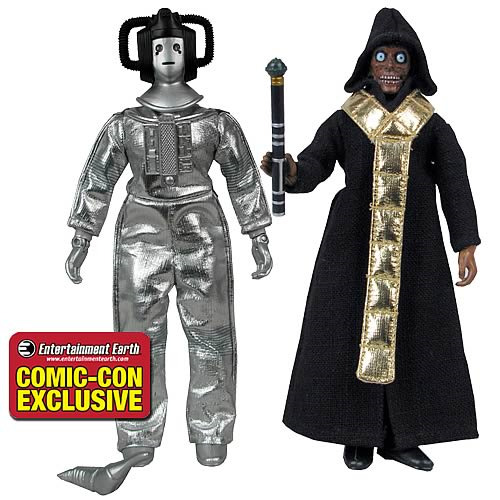 Every Doctor Who collection needs a Cyberleader, and here he is in metallic silver and black! The Cybermen are cold, emotionless figures, encased in steel suits, their original humanity stripped away and replaced by machinery and computers. The Doctor has encountered the Cybermen countless times throughout time and space. In the 30th century, the Cybermen had been at war with Earth for hundreds of years, and the war had taken its toll. At that point, gold was lethal to them. One last group of Cybermen led by a black-helmeted Cyberleader made an attack on Voga, the planet of gold. The Fourth Doctor was able to help the native Vogans defend their planet and destroy the remaining Cybermen. Cybermen not included. The Master well deserves his own action figure. Bif Bang Pow! obliges with this eye-popping figure that's cloaked and sure to delight any fan. The Master is the most evil, malevolent Time Lord ever-- and the Doctor's sworn enemy. When the Fourth Doctor returned to Gallifrey after receiving a distress signal from the Time Lords' computer Matrix, the Master was at the end of his regeneration cycle and was a skeletal husk clothed in a tattered cloak. The Master was at the heart of a conspiracy to bring down the Time Lord High Council, and framed the Doctor as responsible for assassinating the President. In his lust for power, the Master stole the Sash and Rod of Rassillon so he could open up the Eye of Harmony and restore his regenerations, and cause the destruction of Gallifrey.